There may be no place like home; that is until you set out across country for a Grand Slam turkey hunting adventure. It’s regarded as one of the proudest accomplishments a turkey hunter can achieve—the Grand Slam. Collecting all four huntable United States subspecies—the Eastern, the Osceola, the Rio Grande and the Merriam’s—can take you virtually from coast-to-coast providing the hunter with not only an incredible variety of hunting challenges, but also an opportunity to tackle diverse terrain and conditions in pursuit of that ol’ longbeard. Sure, there are few things in life more enjoyable for a turkey hunter than taking to his favorite hunting spot with a close family member or friend. The memories that are created, the affinity that you feel for a property that you know as well as the inside of your own home and the endless challenge that those turkeys you’ve come to consider as your own are hard to beat. But for the traveling hunter, the pursuit of a Grand Slam gets under their skin. Try it, and it will get under yours as well—guaranteed. The Eastern Wild Turkey subspecies is by far the most numerous and wide ranging. Located throughout the Eastern half of the United States, this subspecies is found throughout New England and southern Canada down to Florida and west to Texas, Missouri, Iowa and Minnesota. It has also been successfully transplanted to pockets of terrain along the West Coast. It’s found in 38 states and five Canadian provinces. 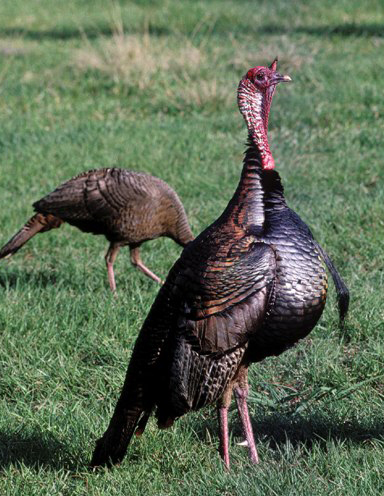 According to the National Wild Turkey Federation (NWTF), Eastern populations are estimated to exceed 5 million birds making it by far the most populous subspecies. Since it ranges the farthest north, Easterns can grow to be among the heaviest and largest of any of the subspecies. The tips of the Eastern’s tail feathers are a dark chocolate brown as are the coverts (the smaller feathers that cover the base of the fan.) Other body feathers are iridescent with a metallic, copper or bronze hue. Primary wing feathers sport black and white barring. Because Easterns range throughout the more populous half of the United States and Canada, it’s no surprise that, as a subspecies, it also undergoes the most hunting pressure. This makes certain populations of Easterns some of the most wary and challenging to hunt, particularly in longtime turkey hunting strongholds such as Alabama, South Carolina, Pennsylvania and Missouri. Easterns range from flat, sea-level terrain to high mountains and steep ridges of the Appalachians in West Virginia, the Ozarks in southern Missouri and northern Arkansas and even the Adirondacks of New York. Hunters need to be as adaptable as the terrain, using it to get close to a tom before setting up and calling. Because much of their habitat is rich in food sources, Easterns don’t tend to congregate in flocks as large as those witnessed among Rio Grande and Merriam’s populations out West. In the early season, toms will hang with small flocks of hens before breeding them and moving on in search of more. 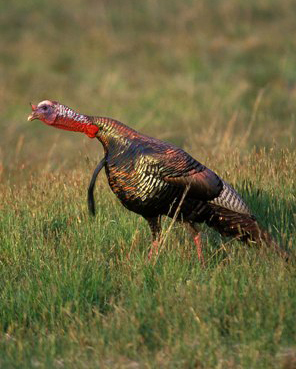 When still flocked up, hunters may want to focus on aggressive calling that can get a boss hen fired up and agitated. Such a hen will typically seek out the hunter pulling the rest of the flock, including the gobbler, along with her. Later in the season, as hens are sitting on nests, lone gobblers are easier to find, though hunting pressure and the waning drive to breed, makes them more wary to calling. Check It Out: Missouri—While bad hatches have strained populations since their heyday in the late 1990s and early 2000s, the rolling pastures and hardwood lots of northern Missouri, as well as the challenging, yet remote terrain of the state’s southern Ozarks still make the entire state a turkey hunting heaven. The Osceola Wild Turkey, also known as the Florida subspecies because it is only found on the peninsula of the Sunshine State, has by far the smallest range and population of the four primary wild turkey subspecies in the United States. Populations are estimated at between 80,000 and 100,000 birds. The Osceola is similar in appearance to the Eastern, but tends to be smaller and darker in color. The white bars on the wing feathers are more irregular and broken. Secondary wing feathers also tend to be darker and the body feathers, while still iridescent tend toward a more greenish/reddish hue. Average weights for toms taken by hunters tend to range between 17 and 21 pounds. Osceolas have a softer gobble than Easterns and care must be used when hunting them on foggy or high humidity mornings as they can sound farther away than they actually are. The Florida peninsula is laden with palmetto-choked swamps, oak motts and wide open pasture lands. Hunters must negotiate near-impenetrable swamps using only open fields or logging roads, making moving on a bird tricky. Understanding the terrain and how to get around it without being seen is crucial. Setting up where birds will fly down from the roost in the early morning or loaf during midday is crucial as hunters are best served calling from one optimal location rather than risk moving around and spooking birds. The biggest challenge to hunting Osceolas is simply finding a place to hunt them. With much of the land privately owned, it can be tricky for hunters to find a place, particularly nonresidents. There are numerous outfitters, though hunts are typically in high demand and can fetch as much as $2,000 or more for a three-day, one-bird hunt. The state offers some draw-only, lottery hunts on public land tracts that are both affordable and offer the do-it-yourself, budget-conscious hunter a quality hunting experience. Check It Out: Florida—Since it is the only place Osceola’s are found, you have no choice. While a guided hunt is always the best way to go, quality limited access, public land hunts are a great option if you can draw a tag.